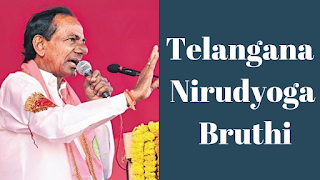 Telangana Nirudyoga Bruthi Scheme details-Telangana Scheme: The Government of Telangana has launched a new scheme known as Telangana Nirudyoga Bruthi Scheme or Unemployment Scheme. Telangana Nirudyoga Bruthi Scheme was officially announced by our Chief Minister Shri. Kalvakunta Chandrashekar Rao on December 2018. And this Unemployment Scheme is going to start in January 2019. The main aim of Telangana Nirudyoga Bruthi Scheme is to provide a monthly allowance for unemployed youth. As per the schedule, the candidates are going to get Rs 3016/- as a monthly allowance under Telangana Nirudyoga Bruthi Scheme. For this Telangana Nirudyoga Bruthi Scheme official website is going to start in January all the eligible applicants for this Ts Nirudyoga Bruthi Scheme need to apply through the online Registration process. No last date for this TS Nirudyoga Bruthi. There are no fees required for this Telangana Nirudyoga Bruthi Scheme. Candidates age should be between 22 to 35 years. Candidates should have completed Graduation, Degree/Diploma from any government recognised university. Candidates who are from Below Poverty Line with white ration Card are eligible for Telangana Nirudyoga Bruthi Scheme. Candidate should not own the land of 2.5 acres magani or 5 acres metta. Candidate should not involve in any criminal case. Candidate should not own a vehicle of 4 wheels or more than 4 wheels. Candidates should not be suspended from any government job. If the candidate has benefited of Rs 50000/- through any government schemes are not eligible for Ts Nirudyoga Bruthi Scheme. Educational certificates of SSC/Inter/Degree or ITI/Diploma. Visit the official website of Telangana state. Go to Telangana Nirudyoga Bruthi Scheme. You can get the form of Telangana Nirudyoga Bruthi Scheme. Next, fill the total form of Nirudyoga Bruthi. Upload the scanned Documents, latest photo and signature of the candidate. Confirmation OTP will get to the provided mobile number.